Commercial – Atlantic Overhead Door And Dock Inc.
ThermoMark™ Model 5255 insulated commercial sectional doors are extremely rugged and durable, with excellent thermal insulation qualities. For commercial projects that require a door with strength, insulation and an overall solid performance, these doors are the ideal choice. With the ability to supply a variety of commercial operators, we supply & install 3 of the best. Are you looking for quality routine maintenance? Did someone knock your overhead door our of line? Motor not working correctly? No matter what the issue, our Service Technicians have the experience and know-how to get the job done right. Contact us today with any questions! Bulb-shaped bottom seal remains flexible even in extreme cold to help keep the bad weather outside. 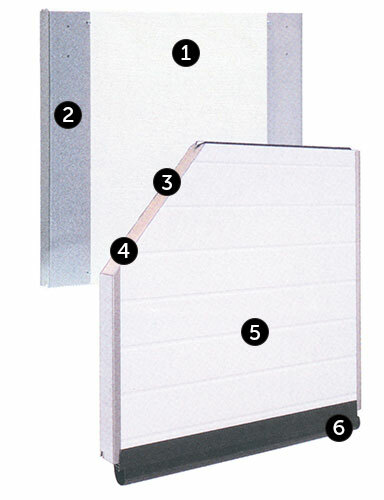 Insulated Vision Lites allow for visibility while maintaining security. Want a quote on a 5255? Please contact us for your worry free quote today!